How do I add my Linux machine to the Dashboard? How can I manage my Linux machines from the Dashboard? Why am I unable to access my Linux machine via dashboard? How do I backup my Linux server using IDrive? Can I schedule backups from my Linux server? Is there any preliminary setting that needs to be done before I start my backup? When I restore data, the permissions and owner / group information is different from source. Why? Is there any simple way to backup MySQL database? While configuring my account, I see two options, ‘Create new Backup location’ and ‘Select from the existing backup location’. Why is that? Why can't I see the ‘Backup type’ for my IDrive account? How can I exclude files/folders from backup set? Can I exclude files/folders based on partial file/folder names? How can I exclude files/folders based on regex pattern? I am getting 'unable to find compatible binary' error during account setting script execution. How do I configure my account? How can I update IDrive scripts manually to newer version, if ‘check_for_update.pl’ is unable to update ? How do I uninstall IDrive scripts package? My scheduled jobs are not running. What should I do? My local Express drive is not listed for selection. How can I get it listed? I am getting the message "You do not have permission to modify the selected settings. Contact the admin of your account". Why? Download the latest script package to your Linux machine. Unzip the package file and go to the scripts folder. Execute 'account_settings.pl' to setup your account and follow the instructions. Execute 'login.pl' to login to your account, if you have not logged in while setting up your account using 'account_settings.pl'. Login to your account via the web interface and your Linux machine will appear in the dashboard now. 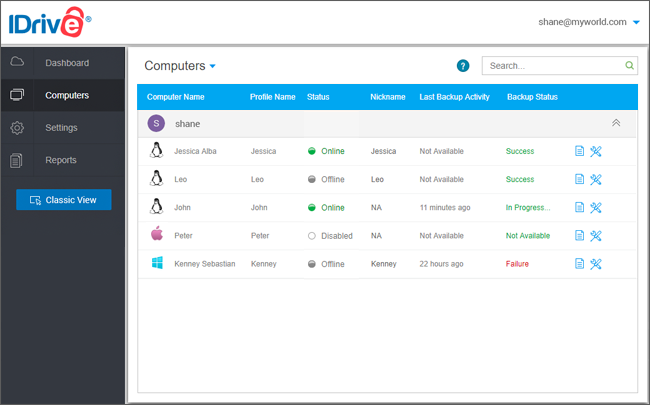 You can remotely configure backup set, manage backup schedules, settings etc. Run 'check_for_update.pl' script from your script path on your Linux machine and follow the instructions. Post updating your scripts to the latest version, you must login to your account. Your Linux machine will appear in the dashboard now. You can remotely configure backup set, manage backup schedules, settings etc. Visit our scripts page for more information. You can manage all your connected Linux machines from the 'Computers' tab on the dashboard. You can also view backup details like last backed up time and the status of each backup. Log in to the IDrive web interface with your user credentials. Click the Linux machine name to initiate or schedule backups, perform restores, configure settings and view logs. The computer is online and web access is enabled. The computer is offline and web access is enabled. Run account_settings.pl and post validation, your account details will appear on the screen. Check if Desktop access is ‘Enabled’. If not go to 'Edit your account details' -> 'Desktop access' and enable it. Check if Dashboard service is 'Running'. If not, go to 'Edit your account details' and select 'Start/Restart dashboard service' to start it. After performing the above checks try to access your machine via dashboard and if the issue persists contact support. Archive Cleanup compares the files of your local storage, selected for backup, with the files in your IDrive online backup account. It then deletes the files present in your account but not on your local machine. This feature thus helps you to free up space in your online backup account. When you try to set periodic archive cleanup via dashboard, you can change number of days after which you like to run archive cleanup and percentage of the total no. of files to be considered for deletion. This percentage based control helps to avoid large-scale deletion of files in your account. Archive cleanup will run only after the days you have selected above from the current date. You can backup your Linux servers using IDrive scripts package, which is a bundle of perl scripts. To perform all your IDrive operations, download the scripts and follow the instructions provided in the readme.txt file. Ensure that you have provided appropriate permissions (executable permission) to the IDrive Backup scripts. IDrive stores your data with a fixed owner / group and set of permissions that may be different from original set of owner / group and permissions. After you restore the data, ensure that the permissions and ownership information is modified appropriately. Follow the below steps to backup your MySQL database. Backup the database dump file using Backup scripts. While configuring your account, two options such as, ‘Create new Backup location’ and ‘Select from the existing backup location’ may appear. This is because, one or more devices are configured with your account but there is no backup location configured for that particular device from which you have logged into the account. So you can either create new backup location for that device or link the device with the existing Backup Location. For some IDrive accounts users may be unable to see ‘Backup type’, because the default backup type for these accounts is set as Mirror. Select option 3 'Edit your Full Path Exclude List'. The FullExcludeList.txt file will open in vi editor. Add full absolute path of the files/folders that you wish to exclude. Enter each item in a new line. Your Backupset contains /home/Documents and if you want to exclude /home/Documents/temp, write this folder path ie: /home/Documents/temp in FullExcludeList file. Yes, you can exclude files/folders from backup set based on partial file/folder names. Select option 4 'Edit your Partial Path Exclude List'. The PartialExcludeList.txt file will open in vi editor. Add the partial name of the files/folders that you wish to exclude. Enter each item in a new line. Your Backupset contains /home/Documents and if you want to exclude all the pst files from this folder like /home/Documents/designtutorials.pst, /home/Documents/new.pst, /home/Documents/James/tutorials.pst etc then write "pst" in PartialExcludeList file. Select option 5 'Edit your Regex Exclude List'. The RegexExcludeList.txt file will open in vi editor. Add the regex pattern of the files/folders that you wish to exclude. Enter each item in a new line. Your Backupset contains /home/Folder01 , /home/Folder02, /home/FolderA, /home/FolderB. If you want to exclude all folders/files that contains numeric values in name ie: /home/Folder01, /home/Folder02 then write \d+ in RegexExcludeList file. Download the zip file from the links below, based on machine architecture. Follow the instructions provided to complete the configuration process. Download the latest IDrive scripts package from IDrive website. Follow the instructions provided to complete the update process. How do I uninstall IDrive scripts package ? Uninstalling the script package from your system will leave the files/folders of your system liable to digital disasters. This script will automatically remove all package script files and other dependency files. It will also cleanup the scheduled backup/restore jobs if any. IDrive cron service must be running for all scheduled jobs to work. Run the ‘account_setting.pl’ script and verify if ‘IDrive cron service’ is running. If the service is not running, select the ‘Edit your account details’ option. Select 'Start/Restart IDrive cron service' option and follow the instructions to start the IDrive cron service. The Express drive must be mounted on your Linux machine to get listed on the dashboard. If the connected device is not listed, then you need to manually enter a mount path to use Express Backup. If you are getting this message, it means your account administrator has locked the setting for you. You must contact your admin to unlock and allow access.